Asset integrity services in isolation are largely ineffective if not underpinned by a targeted and proactive centralized maintenance management system (CMMS). It is now widely recognized in industry that integrity and maintenance systems are inter-connected and work hand-in-hand to ensure that assets are operated in a safe and reliable condition. AIE is able to provide our clients with a complete maintenance build service solution which links integrity management and maintenance systems together under one umbrella so that both are driven by the asset’s CMMS. This provides a number of tangible benefits across a range of industries such as Oil and Gas, Power Generation and Nuclear. We utilise our CMMS development software to efficiently develop maintenance systems for our clients following a proven and established process. Our software aids in the manipulation of data and provides an efficient and quality controlled platform for the development of the maintenance system. We are flexible and fully understand the challenges that most clients face when it comes to defining their assets and documenting the specifications for them. We have experience in building asset databases and maintenance strategies for both new and aged facilities across a range of industries such as Oil and Gas, Power Generation and Nuclear where little data exists, and a site-based verification strategy is required. In the process of this work we are able to identify various errors in drawings and technical information. Our drafting team ensures that any inaccuracies are communicated clearly to ensure that modifications can be made. Our CMMS development software facilitates criticality analysis which is performed by our experienced maintenance and safety engineers. This analysis is then used to define the equipment’s maintenance strategy and its criticality for integrity and maintainability. Following our well-trodden approach to SCE identification, our maintenance and integrity specialists define SCE and generate associated performance standards to ensure that the maintenance build is linked to the integrity management system and covers key essential requirements. Developing asset-wide maintenance strategies to cover all maintainable equipment is a sizable undertaking. This varies from strategies for pressure safety valves, flexible hoses, instrument tubing, pipework vibration all the way to planned maintenance requirements to ensure effective integrity management. 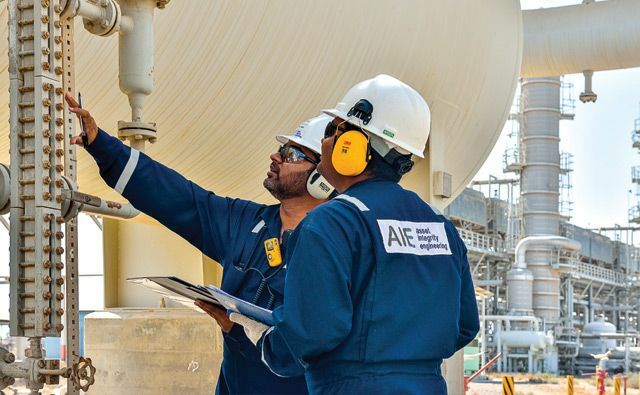 AIE consults and offers training on reliability centered maintenance across a range of industries such as Oil and Gas, Power Generation and Nuclear. AIE has developed a comprehensive set of generic maintenance strategies which are based on RCM failure data and our in-depth knowledge of the industries we serve. They offer an efficient approach to building an asset-wide maintenance system which can then be tailored to meet the demands of specialized or high criticality equipment. Our CMMS development software and work flow procedures are flexible and can be adjusted to accommodate all our client’s requirements. We are able to implement maintenance builds which are fully compatible with most propriety maintenance software providers for example Maximo, Oracle and SAP.